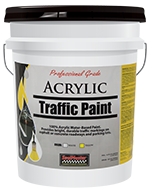 High Performance 100% acrylic paint designed for bright, durable traffic markings on asphalt or concrete roadways and parking lots. SealMaster® Acrylic Traffic Paint is an acrylic water based paint formulated for striping exterior or interior asphalt and concrete surfaces. 5 Gallon Pail 65 lbs. 55 Gallon Drum 715 lbs.